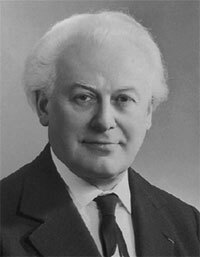 Louis Pierre Couffignal (1902-1966), a French Mathematician and Cybernetics pioneer, was born in Monflanquin, Fâcheries, on 16 March 1902, in a humble family: his father Guillaume Couffignal (born 1858), was a chief cantonnier, his mother, Marie Deroux-Couffignal (born 1871), was a tailor. After attending a primary school at Monflanquin, in 1913 Louis enrolled in the Collège et au Lycée de Villeneuve sur Lot, where he received a bachelor degree in Latin, sciences and mathematics. After graduation he remained in the college as a part-time lecturer, later on continued his work as a lecturer in other colleges. Couffignal was almost 20 years director of Laboratoire de Calcul Mecanique at the Institut Blaise Pascal. Couffignal died on 4 July, 1966. Couffignal was a pupil of the prominent French mathematician Maurice d'Ocagne (1862-1938), who instilled him with his own passion for calculating machines. Couffignal published several articles and sent several notes to the French Academy of Science regarding calculating machines. The first note was in 1930, and is devoted to a new calculating machine. In 1932, he organized in the Collège de France a conference on the “calculating machines, their principle and their future”. In 1933 he published a monograph for calculating machines. 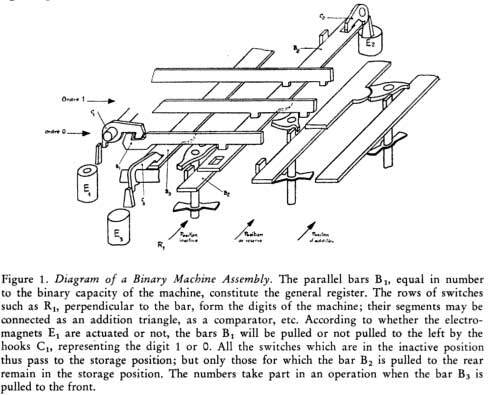 In 1936 appears his decisive note on “the use of the binary notation in the calculating machine”. In 1938, Couffignal published an article, important for cybernetics, where it defines the machines as “a whole of inanimate or partially animated beings or even exceptionally animated able to replace the man” and further: “Since the machine is made for the man, it is field of the mechanical analysis to acquire an overall picture of the various activities where the man was or could be replaced by the machine, and to establish laws of substitutions”. In the same 1938, he becomes Ph. D. thanks to his thesis “The mechanical analysis, application to the calculating machines and the celestial mechanics”, which poses the principles of the electromechanical binary all-purpose computer. In his thesis he described two calculating machines: a decimal calculator, and a binary electromechanical program-controlled calculator. There is also another Frenchman, who devised binary-based calculating machine even before Couffignal—Raymond Valtat (Valtat filed a patent in 1936 for a mechanical calculator founded on the conversion of decimal input into binary prior to calculation). Without entering into very great detail, we believe we have shown that it is possible to construct a calculating machine, able, without any intervention by an operator, to execute a sequence of calculations, to store the intermediate results, to read mechanically a function table and to print all the numbers, recorded in its registers; we think that in view of its capacity the machine may be considered to be of great simplicity. It is worth noting, that the connections between different parts of the machine are all electrical; the arrangement of the latter does not clash with any of the geometric or kinematics constrains which one meets with in a purely mechanical device, where all movements are caused or guided by physical contact: the number of each different type of component is therefore theoretically unlimited and in practice very high. In late 1930s Couffignal was appointed director of the laboratory for calculation and mechanics in the Institut Poincaré, where he found himself alongside laboratories in which there was a certain amount of calculating machinery and some computing staff. In December 1939 the French Army suggested to Couffignal that he should turn his laboratory into a center for artillery calculations and should equip it with a powerful machine. At that time Couffignal had arranged a contract (worth FF 80000) for the construction of an electromechanical linking of a Sanders-Octoplex 10-column accounting machine to a Monroe A-1-213 calculating machine. This link was to enable any number produced by either machine to be transferred to the keyboard of the other, and all operations would be controlled automatically by means of a perforated tape. Couffignal was to find his plans held up by the start of the war and the occupation of France. After the war however, in 1947, Couffignal obtained the grants he needed for the building of his machine. He designed and the French computers manufacturer Logabax manufactured in 1952 the first French electronic digital computer. This universal computing machine (see the lower image) contained 2000 tubes, but in fact, the machine was never finished and put in production. From January 8-13, 1951 the Paris symposium, Les Machines á calculer et la pensée humaine (Calculating Machines and Human Thought) took place at l'Institut Blaise Pascal. 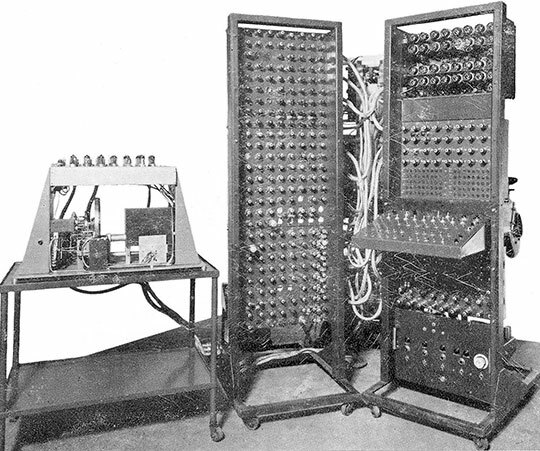 Unlike the other early computer conferences, no demonstration of a stored-program electronic computer occurred, but Couffignal demonstrated the prototype of his non-stored-program machine.